← Location for our Quilt Show has changed!!! June 17 and 18, 9 a.m. to 5 p.m.
To download the map and directions in a PDF format that you can print out, click here. 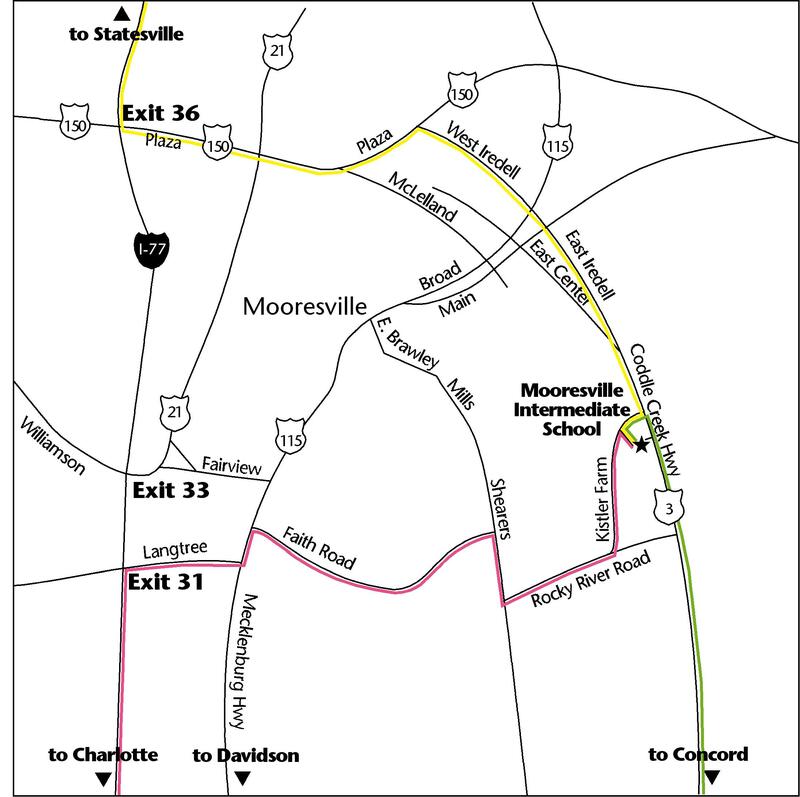 NOTE: There are two entrances to Mooresville Intermediate School. One is off NC 3/Coddle Creek, and the other is off Kistler Farm Road. Each has a parking lot, but the two lots are not connected. From Charlotte: Take Exit 31. Turn right on Langtree Road and drive 0.9 miles. Turn left onto NC 115N/Mecklenburg Highway, and drive 0.2 miles. Turn right onto Faith Road and drive 2. 8 miles. Turn right onto Shearers Road and drive 0.5 miles. Turn left onto Rocky River Road and drive 0.8 miles. Turn left on Kistler Farm Road and drive about 1 mile. Turn right into third school entrance, and go 0.4 miles to parking area on left. From Statesville: Take Exit 36. Turn left (east) onto NC 150 and drive 2.7 miles. Turn right onto West Iredell Avenue/NC 3. Drive 3 miles. Turn right on Kistler Farm Road and drive 0.4 miles. Turn left into the first of the three school entrances, and go 0.4 miles to the parking area on left.